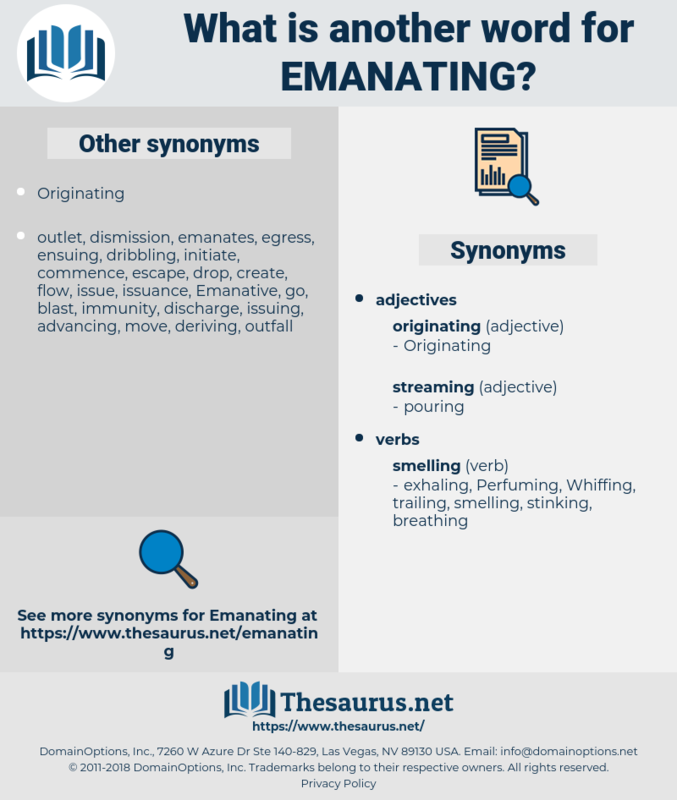 What is another word for Emanating? 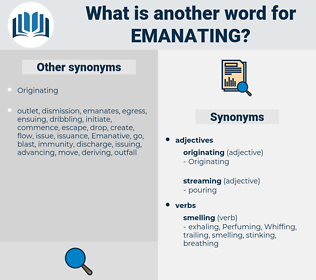 Originating, Initiating, Incorporating, Confiscating, emerging, representing, existing, Relating, hailing, Embodying, Pertaining, Instituting, Formulating, Empowering, Suggesting, deriving, Stemming, situating, Arising, Pasting, coming, Presenting, Engendering, Accruing, Recommending, Elaborating, oncoming, incoming, belonging, moving, pursuant, underlying, appearing, Inserting, inspiring, Outlining, upcoming, latest, issuing, rendering, reflecting, Granting, remaining, conferred, Conferring, breathing, leading, ensuing, Submitting, starting, broadcasting, resulting, traveling, travelling, entering, Introducing, entrusting, Occurring, Evolving, inputting, dating, arriving, products, Exerting, prevailing, Producing, Electing, posing, recording, proceeding, rising, drawing, airing, burgeoning, owing, Enshrining, Vesting, Resting, Proposing, unfolding, Placing, typing, Attaching, exporting, flowing, Deposited, Registering, Endowing, judging, framework, devising, imposing, Spanning, goods, sponsoring, yielding, Enrolling, listing, budding, Charging, lodging, force, raising, Linking, product, Waging, asking, putting, making. The next proposition which I state is this: " That, by the public law of the world, the law of nations, and the laws of war, the commission in evidence, supported by the proof in the case as to the color of authority under which it was issued, would afford adequate protection to the defendants against a conviction for piracy; and being an authority emanating neither from a foreign Prince nor foreign State, nor from a person merely, the offence charged in the last five counts of the indictment, is not within the purview of the 9th section of the Act of 1790, and the defendants cannot be convicted under either of those counts, if they acted in good faith under that commission." Thoughts of good will, sympathy, magnanimity, good cheer - in brief, all thoughts emanating from a spirit of love - are felt in their positive, warming, and stimulating influences by others; they inspire in turn the same types of thoughts and feelings in them, and they come back to us laden with their ennobling, stimulating, pleasure - bringing influences.